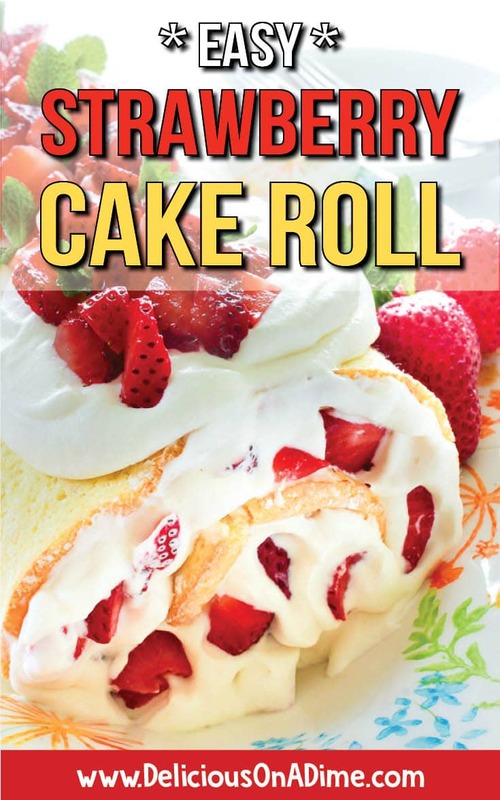 This Easy Strawberry Cake Roll looks fancy but it’s so simple to make! Perfect for Mother’s Day brunch, Father’s Day dinner, graduation parties or casual BBQs, it’s the most lovely spring or summer dessert for any occasion. And it’s a pretty cheap way to feed a crowd too! What’s more summery than strawberry shortcake? When I was brainstorming this recipe I really wanted to come up with an easy summer dessert recipe for a crowd. 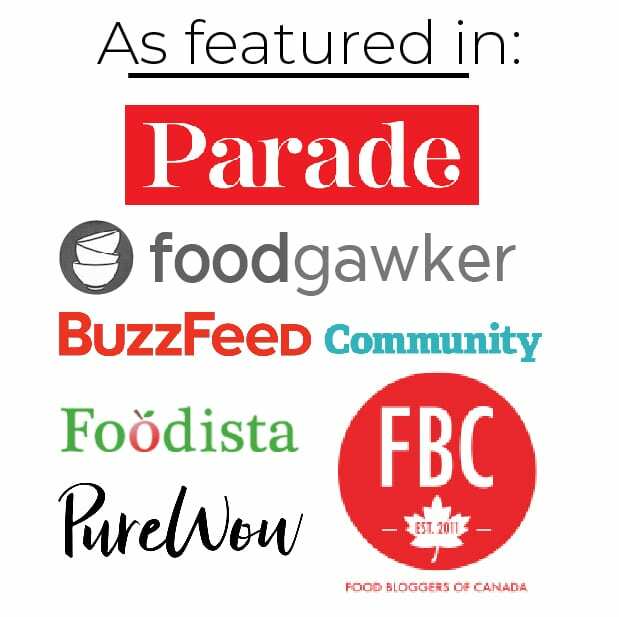 Mother’s Day, Father’s Day, Canada Day, 4th of July, summer parties, brunches, bbqs and potlucks – all perfect opportunities to gather with friends and family and enjoy delicious food and good company! There’s not much that’s as cheap to make as homemade cake. 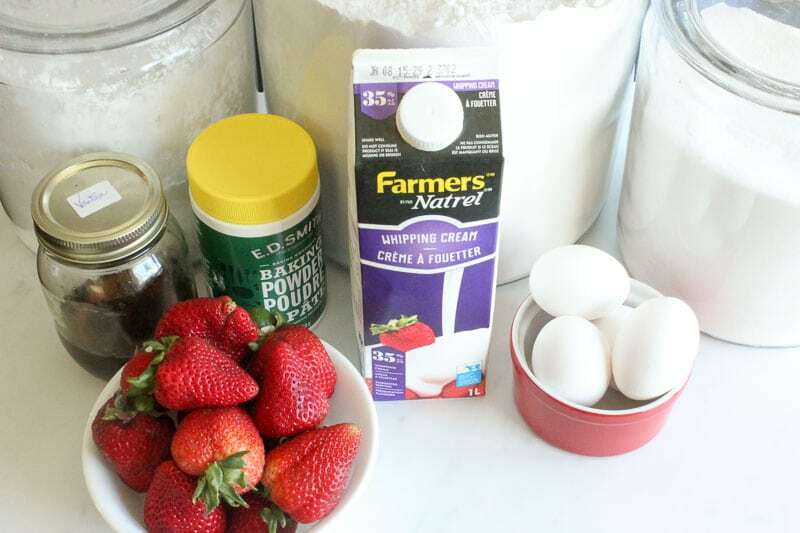 Flour, a few eggs, sugar… all super cheap pantry and fridge staples. 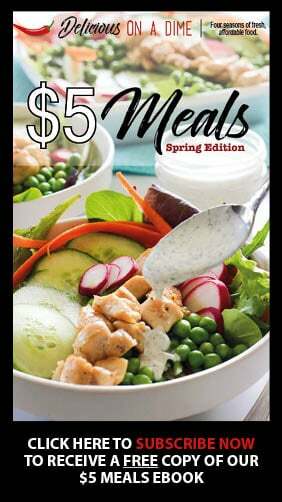 Throw in a container of seasonal fresh strawberries (often on sale right now, even in Atlantic Canada, where I live) and a bit of whipping cream and this shouldn’t be too expensive at all! 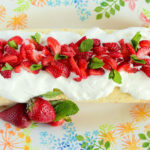 This Easy Strawberry Cake Roll brings you soft white cake, sweet vanilla whipped cream and luscious summer strawberries – in a convenient make-ahead dessert. It’s a winner all around! Strawberries not your thing, or out of season? I’ve included some other filling ideas below the recipe – check them out for more inspiration! 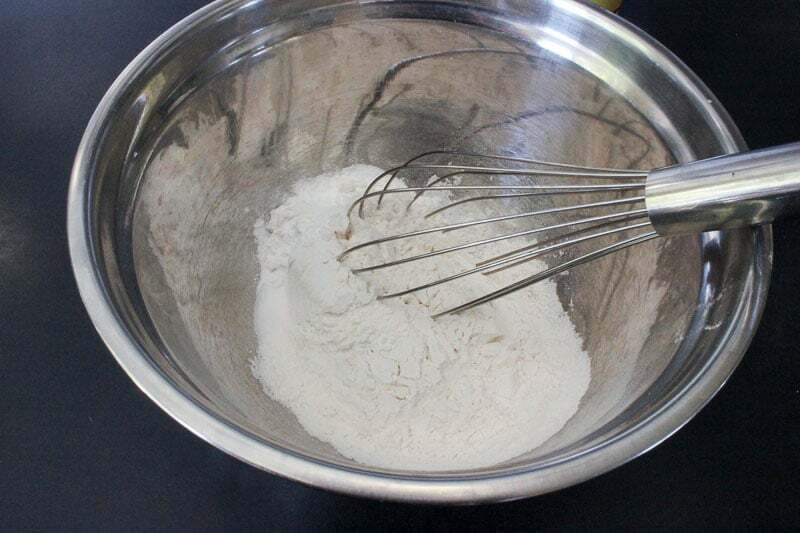 Whisk together 1 cup of flour, 3/4 teaspoon of baking powder and 1/4 teaspoon of salt in a small bowl. Set aside. In a larger bowl, whip four room temperature eggs (if your eggs are in the fridge, let them sit in a bowl of warm-hot water for a few minutes to warm up, draining the water and refilling once it cools) until they’re light and fluffy. Add 1 cup of sugar and mix well. Then add the soured milk you made earlier and 1 tablespoon of vanilla extract (try making your own!) and mix again. Add 1/2 the flour mixture and mix until just combined. Add the rest and mix until just combined. DO NOT OVERMIX. Spray a cookie sheet with cooking spray. 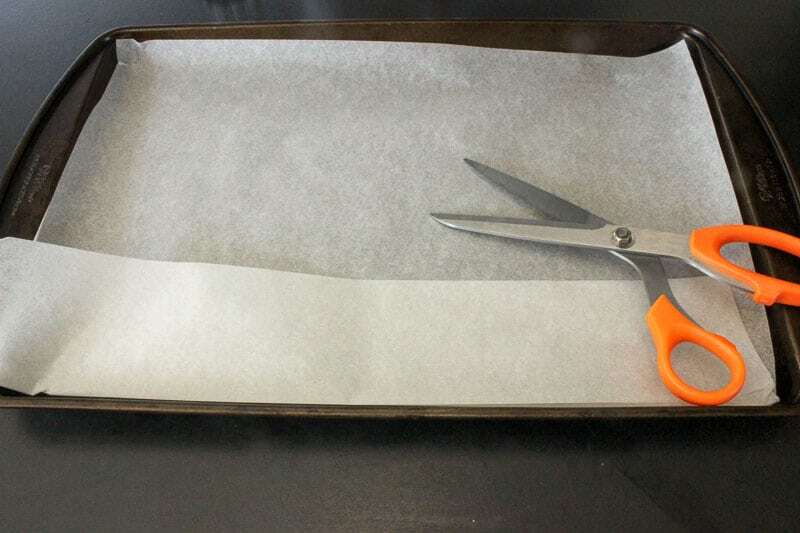 Measure and trim a piece of parchment paper to fit into the base of the cookie sheet. Nestle it into the sheet and then spray again with cooking spray, including the inner sides of the cookie sheet. 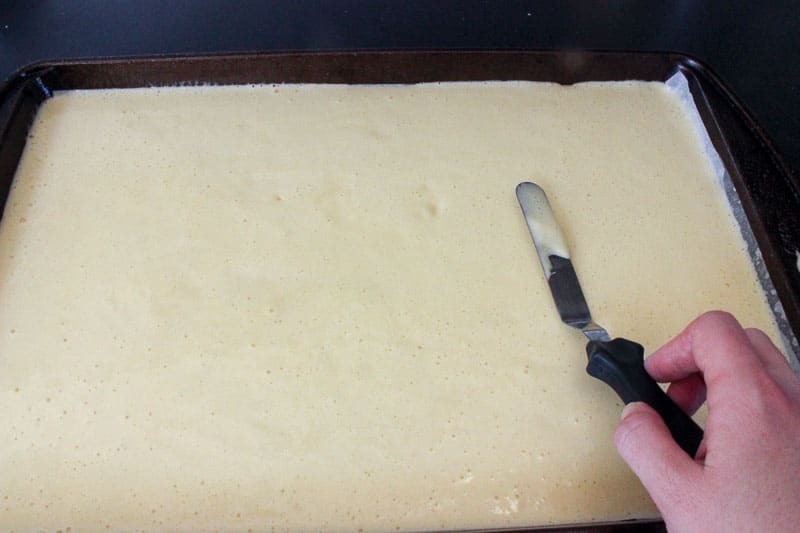 Pour batter into parchment paper-lined cookie sheet and use an offset spatula to spread the batter all the way into the corners, so that it’s evenly distributed. Having less batter in the edges/corners is one of the biggest culprits for burnt or crispy edges. 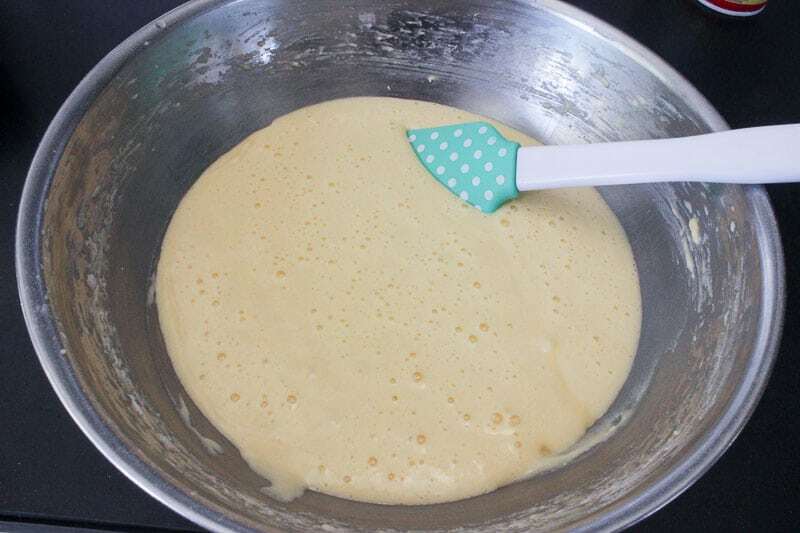 If the batter is the same depth throughout the pan it will cook more evenly. I also tapped my pan gently a few times to get rid of air bubbles. Bake in preheated oven for 14-17 minutes. Keep an eye on it toward the end of the baking time. If your edges start to brown, it’s likely done. If you’re not sure, insert a toothpick in the centre and if it comes out clean it’s done. A lot of recipes say that if you touch the cake gently it will spring back when it’s done but I don’t find this is always the case. 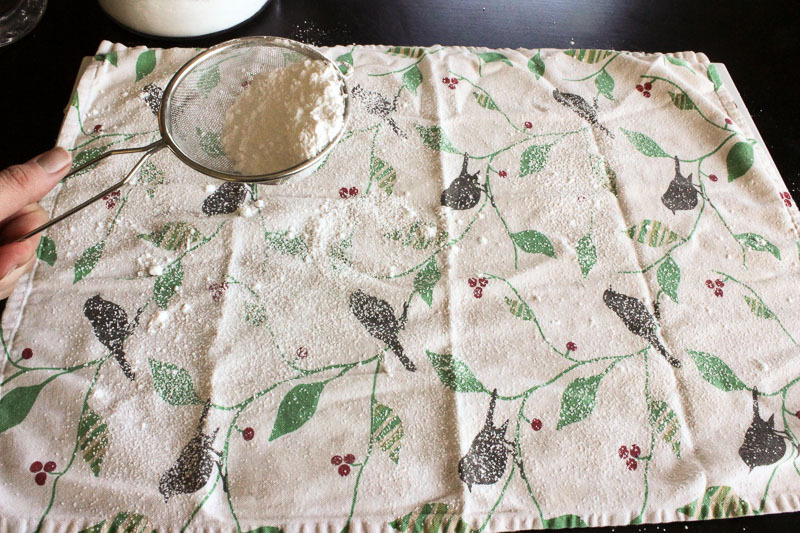 While cake is baking, lay out a clean tea towel and dust it with icing sugar. Wash and slice one pound of fresh strawberries into small pieces. 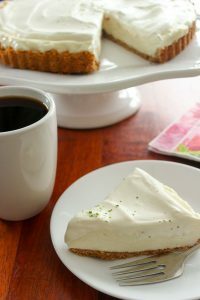 Whip two cups of whipping cream with 2 tablespoons of sugar and 1 teaspoon of vanilla extract, until fairly stiff peaks form. Refrigerate if it will be a long time before you use it. 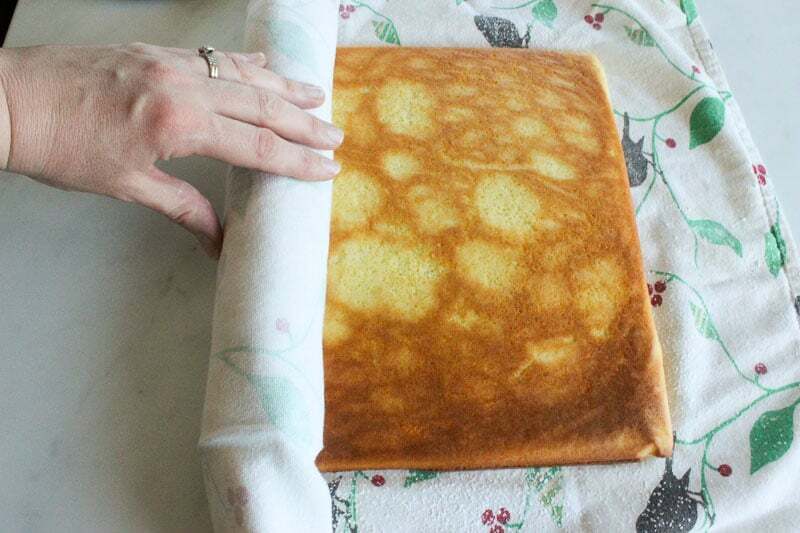 When cake is cooked, invert it onto the tea towel while it’s still hot and gently peel off the parchment paper. While cake is still hot, slowly and gently roll it up in the tea towel, starting from a narrow (side) edge. Leave rolled in the towel until cool. Once the cake is cool, you can gently unroll it, remove the towel and use a serrated knife to trim off any overcooked edges. Set aside 1 cup of sliced strawberries and 1 cup of whipped cream for garnish. 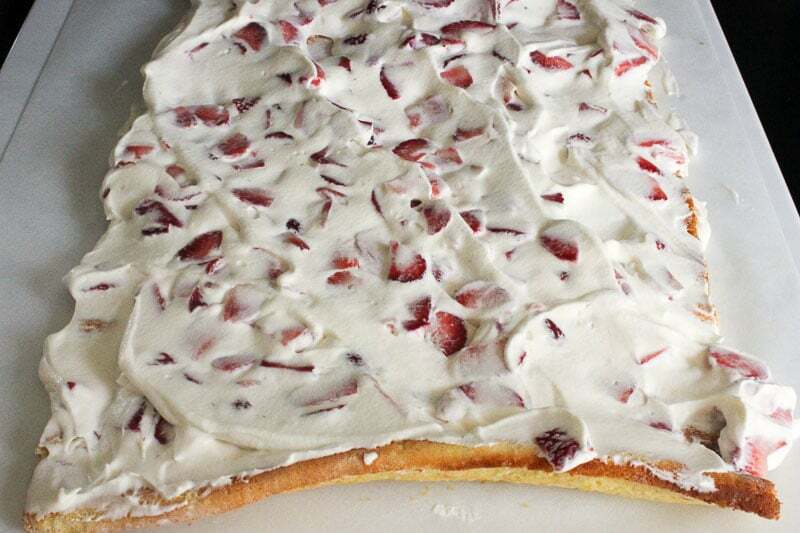 Mix together the rest of the strawberries and cream and spread over cake. Starting with the same end where you started the roll before, gently (and as tightly as possible) roll the cake back up with the filling inside. Place cake, seam side facing down, on a platter. Spoon remaining whipped cream on top and cover with remaining strawberries. Garnish with fresh mint leaves (optional). Refrigerate until ready to serve. 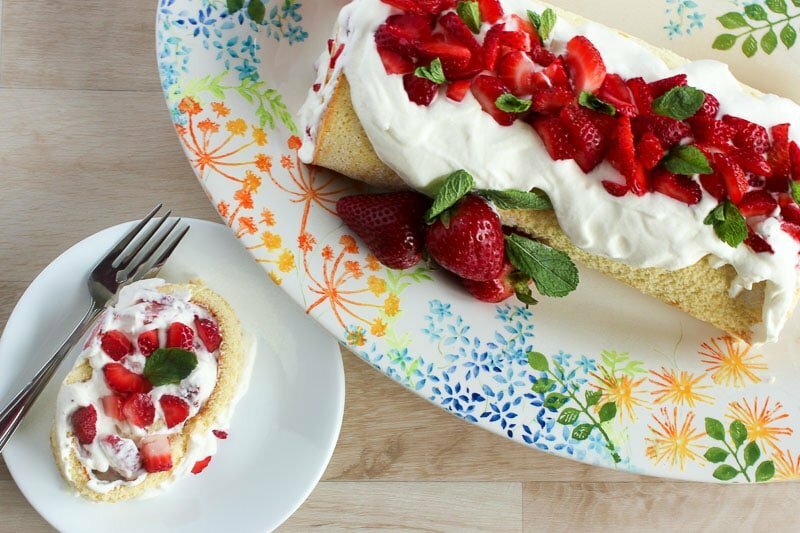 This Easy Strawberry Cake Roll looks fancy but it's so simple to make! 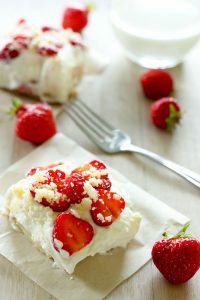 Perfect for Mother's Day brunch , Father's Day dinner, graduation parties or casual BBQs, it's the most lovely spring or summer dessert for any occasion. And it's a pretty cheap way to feed a crowd too! 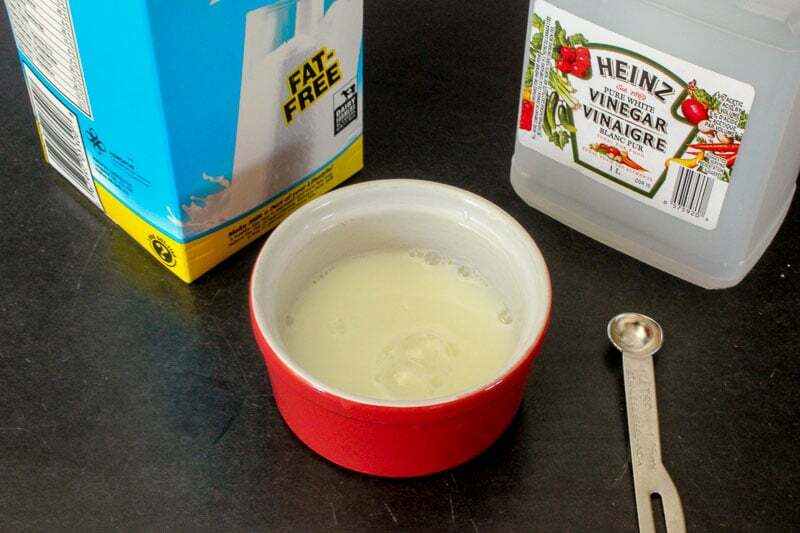 In a small bowl, stir together milk and vinegar and set aside for a few minutes to sour milk. In a larger bowl, whip four room temperature eggs** until light and fluffy. Add sugar and mix well. Add soured milk and vanilla and mix. Add 1/2 the dry mixture, mix until just combined. Add remaining dry ingredients and mix again until just combined. Don't overmix. Spray a cookie sheet with non-stick cooking spray. Measure a piece of parchment paper to fit into the bottom of the pan, nestle it in and spray again with non-stick cooking spray. 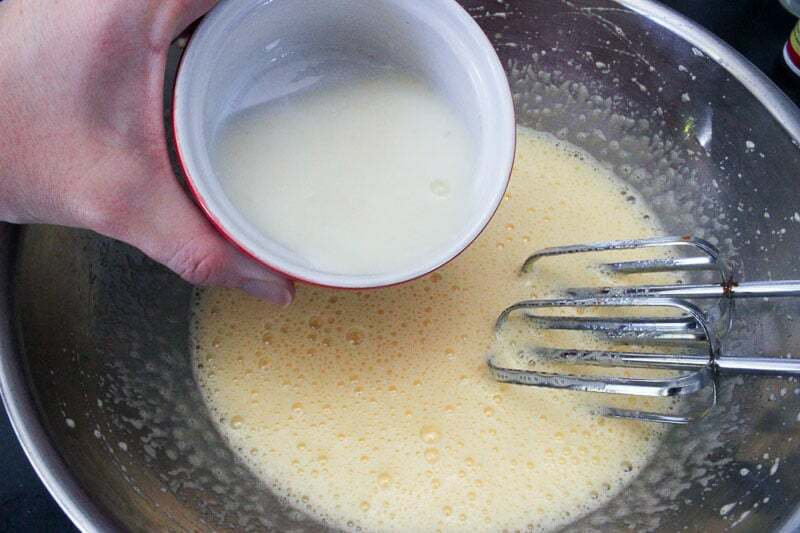 Pour batter into pan and use an offset spatula to spread it evenly, right to the edges of the pan (thinner edges will cook faster and are more likely to burn). Bake in preheated oven for 14-17 minutes. Watch edges closely to make sure they don't brown. If they do, cake is likely done. If you're not sure, insert a toothpick into the centre of the cake and if it comes out clean it's done. While cake is baking, spread out a clean tea towel and sprinkle it with icing sugar. 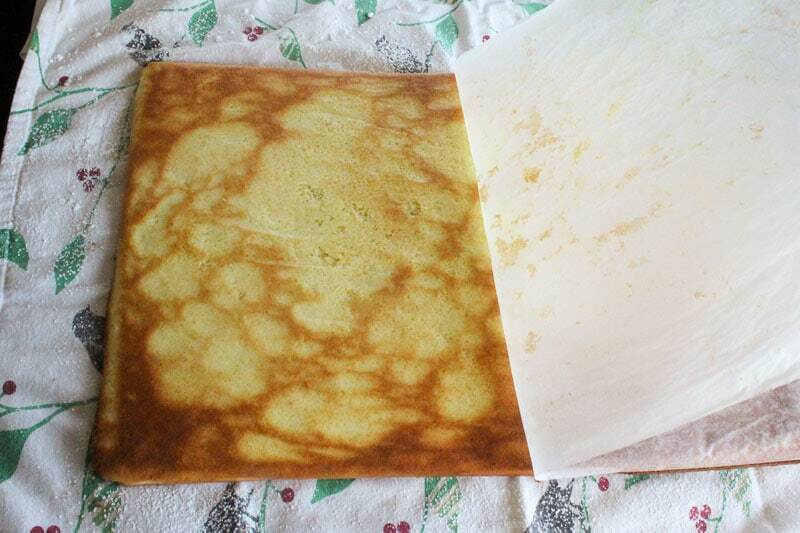 When cake is done cooking, invert it onto the tea towel (while still hot) and gently peel off parchment paper. Starting at a narrow end, gently and tightly roll the cake and tea towel together up into a roll. Set on a baking rack to cool completely. 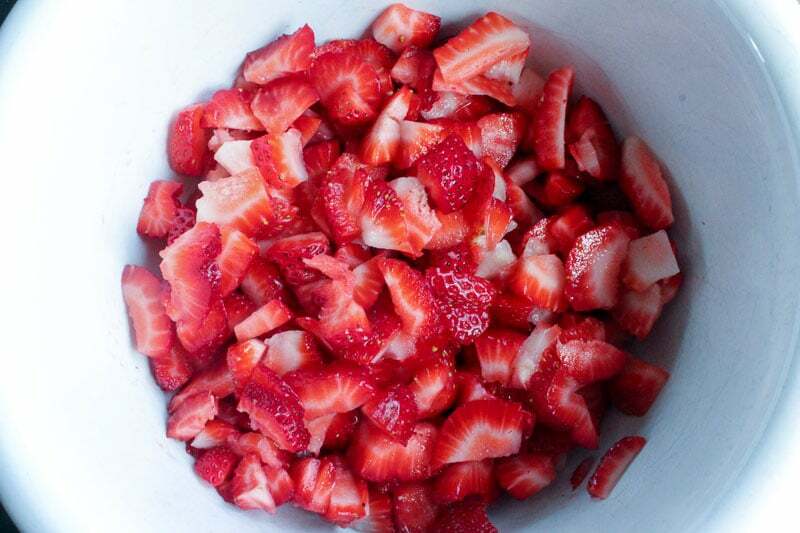 Wash and slice strawberries into small pieces ans set aside. 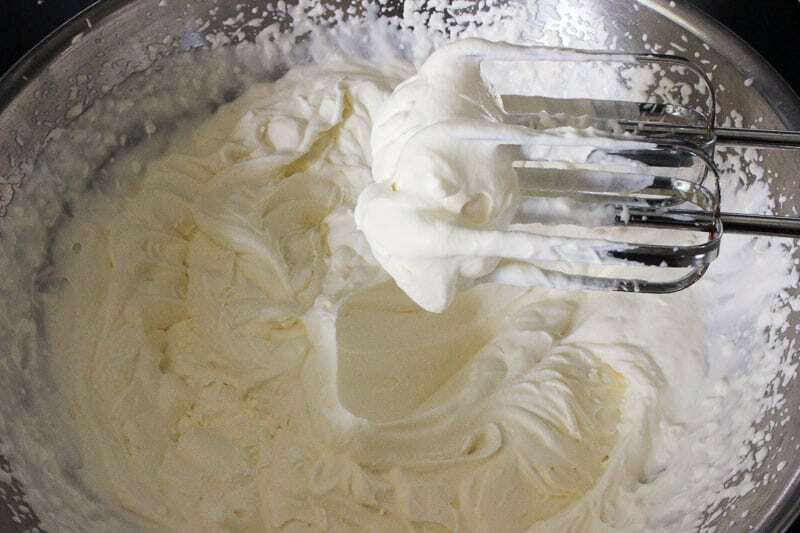 Whip whipping cream with sugar and vanilla until still peaks form. Refrigerate if not using right away. 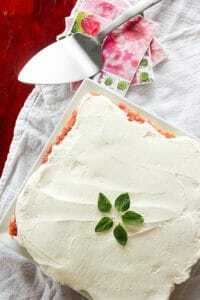 When ready to fill cake, first set aside 1 cup of strawberries and 1 cup of whipped cream to garnish cake later. Mix together remaining whipped cream and strawberries. Gently unroll cooled cake and trim off any overcooked edges, if necessary. Spread filling inside cake and carefully roll cake up again. Set on a platter with seam side facing down. 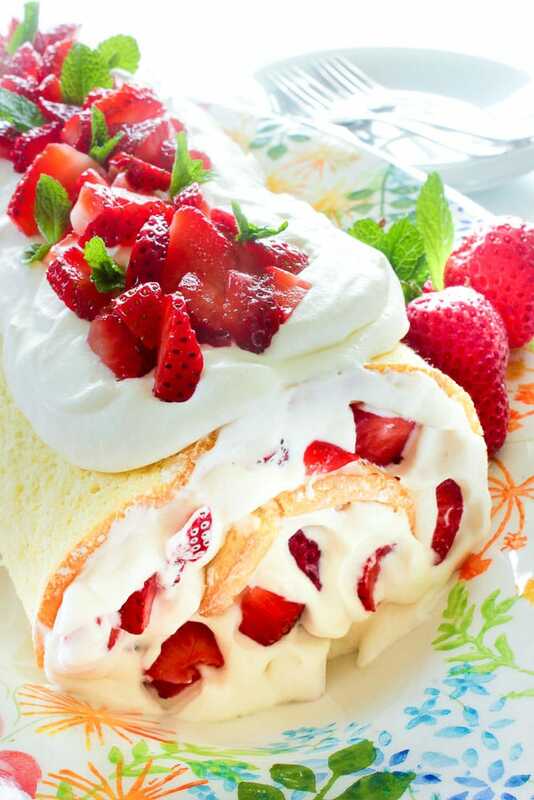 Spread remaining cream on top and top with strawberries. Garnish with mint leaves (optional). Refrigerate until ready to serve. *To make your own homemade vanilla extract and save some money, check out our easy recipe! **To quickly bring eggs to room temperature, submerge them in a bowl of warm-hot water for a few minutes (drain and refill if water cools before eggs warm up). 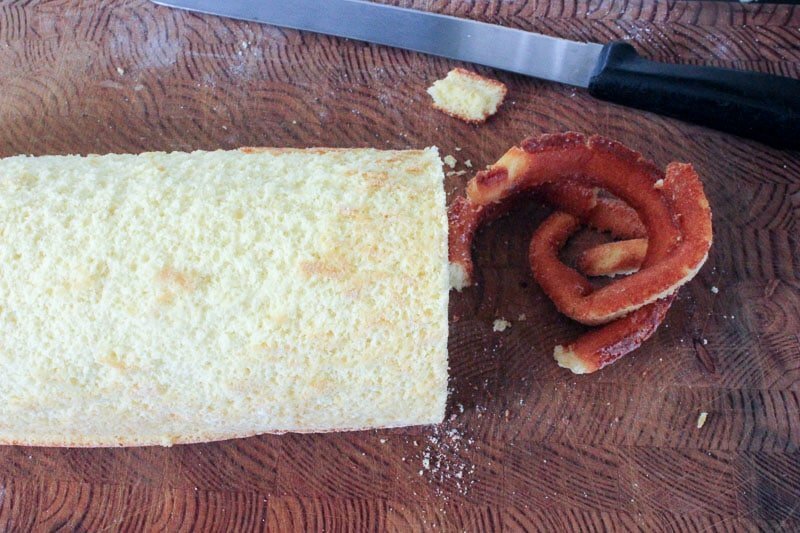 Is a cake roll the same as a jellyroll / Swiss roll / roulade? Yup! For all practical purposes, anyway, it is. There might be some small technical differences and styles, but most people use these terms interchangeably. So you can call it whatever you like! What else can I use as filling in my cake roll? I’m SO glad you asked! You could definitely use other summer berries and fruit – blueberries, raspberries, peaches and even blackberries or kiwi would be delicious. You could do a strawberry and blueberry mixture if you’re looking for an easy, make ahead 4th of July dessert! Lemon curd and whipped cream would be lovely, with or without berries. You could also do Nutella, or a classic jam (or even peanut butter and jam!) if you want! Basically almost any type of fruit that won’t brown, or any type of spread that’s not too watery. Hi Janay, I don’t think the finished product would freeze well at all – I think the whipped cream and berries would make the cake mushy. But people do freeze unfrosted cakes all the time. If you want to try it I would freeze it rolled up, wrapped well in stretch wrap. 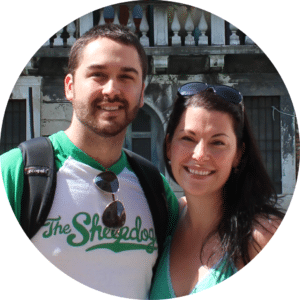 This is just my instinct though – I’ve never tried it, so please take this advice with a grain of salt! Please let me know if you try it and how it works out for you! I’ll let you know how it turns out. 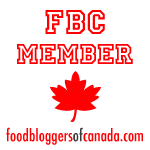 Thanks for posting, Myra!